When I was young, I dreamed of being an artist. I loved making art and sharing it with people—reveling in the connection it inspired among people. When I started college, I carried my passion for painting, drawing, and creative writing with me. Then I slogged through the most agonizing English class and felt an identity crisis looming! But change can be a good thing. And soon thereafter, I discovered Geography. Maps? Capitals? How could there possibly be enough to study for a major? Fortunately, it all clicked together and I was hooked. Why? Because Geography is about connections between people and places, communities and countries. It is about relationships between people, and how cultures and ideas become mainstream or marginalized. It is about resources and the way people move commodities, enact policies, construct borders and zone neighborhoods. And finally, Geography is about power—specifically, which people and places hold power, and how people endure, resist, shift or disrupt power structures. As I learned more about Geography, I felt myself learning a new language. Geography’s frameworks of connection, relationships and power resonated with me, aligned with what I believed at my core. I just hadn’t had the words to express them previously. But through the lens of Geography, everything came into focus, and I quickly forged new pathways of exploration and expression. 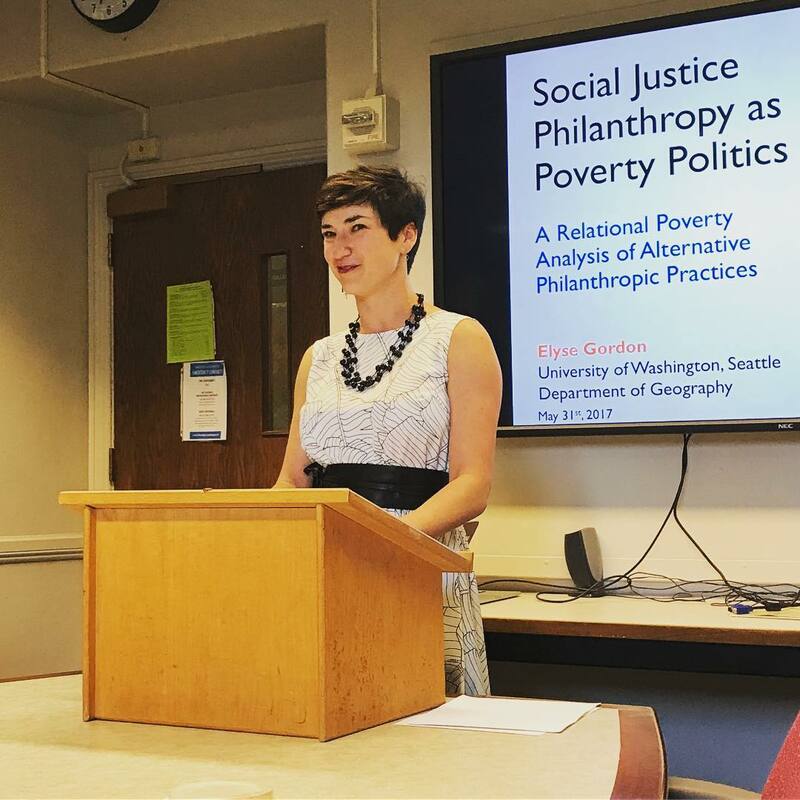 After a few years, I earned my PhD in Geography with a dissertation that centered on the small but growing field of social justice philanthropy—the limitations and possibilities for niche forms of philanthropy to transform individuals, communities and the charitable sector. I also leaned into the practice of social justice philanthropy locally by participating in my own Giving Project with the Social Justice Fund in Seattle and, after living for a time in Minneapolis, co-founding Eat for Equity Seattle. In addition, I fell in love with teaching. For two years, I served as a lecturer in Geography at University of Washington Bothell, leading classes on culture, power, mapping, storytelling, the nonprofit sector, identity and social change. To this day, I enjoy helping students understand the way philanthropy works, and the challenges and opportunities that abound in empowering, enabling and funding long-term social change. Joining Philanthropy Northwest as Program Manager for the Learning Network was a natural next step, helping me combine my academic interests with my passion for strengthening the philanthropic sector. What’s more, I’m a great believer in the power of place and truly admire the way by which Philanthropy Northwest honors the diverse peoples and places of our region while simultaneously encouraging connection and engagement between them. All in service to a better, more equitable tomorrow. In my role, among other duties, I will be organizing Philanthropy Northwest's annual conference. Although I’ve big shoes to fill (thanks to the amazing, incomparable Lyn Hunter! ), I’m excited to help create space for connection, dialogue and problem solving in collaboration with such a dynamic group of people and organizations. I know I won’t have all the answers, but I hope to be a useful facilitator, guide and resource. Plus, I’ve so much to learn from you! I truly cannot wait to get to know Philanthropy Northwest’s members—your unique connection to the places you call home and the community-based solutions you support and inspire. I also am honored to partner with you in realizing our shared vision for a more inclusive, effective and transparent philanthropic sector. Until then, and every step of the way, if you have any questions or want to geek out on Geography, map-making, qualitative analysis or pedagogy, please contact me by phone or email!